Market Reports on South Africa Provides the Trending Market Research Report on “Apparel Retail in South Africa Market Outlook to 2022” under Consumer Goods category. The report offers a collection of South Africa market Trends, South Africa market analysis, South Africa business trends, and South Africa market size and growth. The South African apparel retail industry had total revenues of $9.3bn in 2017, representing a compound annual growth rate (CAGR) of 8.7% between 2013 and 2017. The menswear segment was the industry's most lucrative in 2017, with total revenues of $3.9bn, equivalent to 42% of the industry's overall value. Online shopping accounts for a very small percentage of the industry value as internet usage is generally limited to high income, young consumers who have internet access and relevant means of payments (bank cards). Save time carrying out entry-level research by identifying the size, growth, major segments, and leading players in the apparel retail market in South Africa. Use the Five Forces analysis to determine the competitive intensity and therefore attractiveness of the apparel retail market in South Africa. Leading company profiles reveal details of key apparel retail market players’ global operations and financial performance. Add weight to presentations and pitches by understanding the future growth prospects of the South Africa apparel retail market with five year forecasts. What was the size of the South Africa apparel retail market by value in 2017? 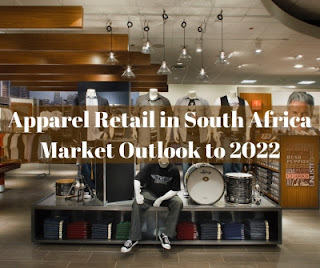 What will be the size of the South Africa apparel retail market in 2022? What factors are affecting the strength of competition in the South Africa apparel retail market? What are the main segments that make up South Africa's apparel retail market? Market Reports on South Africa is thus the one-stop solution for the entire market research requirements with regards to South Africa. We provide you with insight and analysis on the country’s economic outlook at the national, regional and city level, presenting a deep understanding of disparities and evolutionary paths. Get a complete, consistent and concise view of your markets with comprehensive industry reports. Our latest regional data-banks, forecasts, and detailed risk ratings will help you to identify risk and opportunities in every industry and develop strategic plans to deal with the competitiveness in South Africa’s market.